By buying this product you can collect up to 224 loyalty points. Your cart will total 224 loyalty points that can be converted into a voucher of ₹ 44.80. The Bajaj Popular Mixer Grinder comes with three jars with the help of which you can do a number of tasks of different quantity. These jars are made of superior quality stainless steel that ensures quality and durability of the product. The juicer jar has a capacity of 1.2 litres and features an easy-grip handle. The mixing jar has the capacity of 300 ml that allows you to prepare all sorts of chutneys and sauces. The dry and wet grinding jar has a capacity of 800 ml and you can grind spices in it. All the jars are provided with PP lids that get attached to the jars tightly and prevent spilling over of the contents. This Bajaj Popular Mixer Grinder comes with razor sharp blades that can conveniently take care of a number of tasks like chopping, mincing, grinding, mixing and more without any hassle. The multi-function blade system works effortlessly and can mince and cut a variety of fruit and vegetable in very less time. This mixer grinder from the reputed brand Bajaj has a power consumption of 450 watts and an operating voltage requirement of 220-240 V. In addition, it comes with the motor overload feature, which prevents the device from getting over-heated and also ensures safety. The safety lock of this Bajaj Popular Mixer Grinder allows the jars to get fixed to the device properly, preventing any accident that may occur when the device is working. The auto shut off feature automatically shuts down the device in case of any power fluctuation or any other fault. The built-in motor protector prevents the motor from getting over-heated. 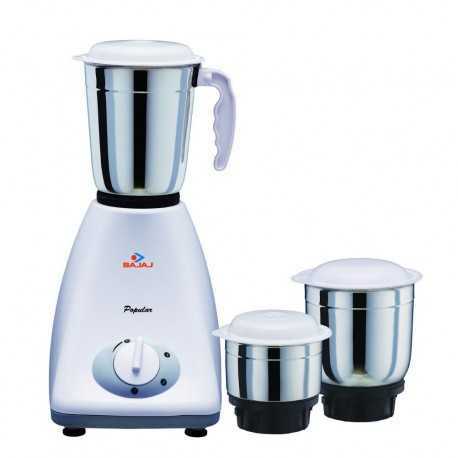 The Bajaj Popular Mixer Grinder has rubber stoppers at the bottom which provide stability on any type of surface, thus preventing it from toppling over. This also prevents any sort of accident that might occur while the device is running. The main unit of the Bajaj Popular Mixer Grinder is made of fine quality ABS plastic that is rust-proof as well as shock-proof. It has a compact design owing to which it can be conveniently stored on any kitchen shelf or a cabinet without any hassle. This white coloured mixer has an ergonomic design and comes with easy to use knobs and buttons. In addition, the leak-proof design prevents leakage and ensures safety while using it. The Bajaj Popular Mixer Grinder is built with a high powered motor with 20000 RPM. The three speed element offers a pulse feature for whipping, and it can be used to make creamy beverages.